Five essential stats ahead of the latest round of Championship action. From Aston Villa's resurgence to positive omens for Norwich and Leeds, we pick five essential stats ahead of the latest round of Championship action. It's a big weekend in the Championship and the action starts on Friday night as West Brom host Aston Villa in the West Midlands derby live on Sky Sports Football from 7pm. Dean Smith's Villa have been flying of late with four wins in five and a remarkable 5-5 draw at home to Nottingham Forest. The run has helped the Villans climb seven places since Smith was appointed manager back in October. In his time in charge, only Norwich have scored more goals and only Leeds have created more chances. They have scored a remarkable 15 goals in their last four games, with Tammy Abraham netting seven. Two of those Abraham goals were headers, as Villa continue to be the head-masters of the division with 15 headed goals for the season now. West Brom fans will be concerned by Villa's scoring exploits: they have failed to keep a clean sheet in their last 11 league games and kept a league-low single shutout this term. However, Darren Moore's side have scored 42 league goals this season - three more than the next best Championship side, Aston Villa, and more than any other team in the Football League. This should bode well for the Baggies. In six of the last seven seasons, the top scorers at this stage have gone on to win promotion. 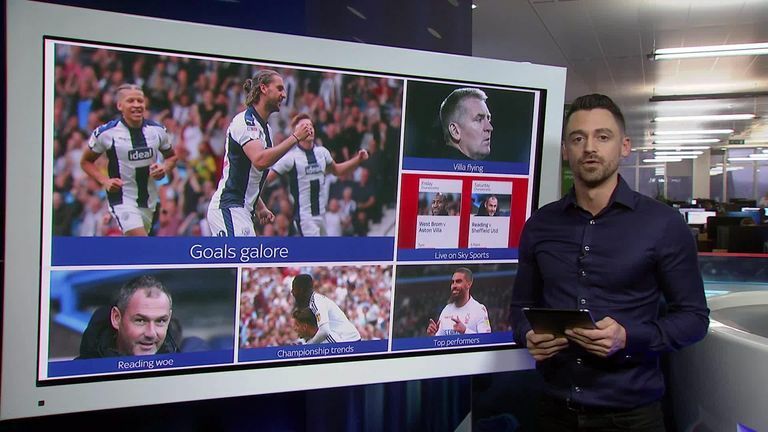 They have already scored 11 more goals than they did in the whole of last season and a league-high 70 goals have been scored in West Brom's games already - another reason for you to tune in on Friday night. Reading sacked Paul Clement on Thursday after just nine months in charge following four games without a win.- with the Royals still hunting for their first victory against a top-13 side this season. Meanwhile, upcoming opponents Sheffield United have failed to score in three of their last five matches, which has seen them take just five points from the last 15 available. Despite the recent dip in front of goal, they have taken 555 touches in the opposition box this season - that's 63 more than any other Championship side. Indeed, it is 203 more than Reading. West Brom's draw at home to Brentford on Monday night means that every Championship club have now played 20 games this season. If we look back at the history of the Championship, then there's good news for Norwich and Leeds fans. After 20 games, the top two have both been promoted in seven of the last 10 seasons - including each of the last two. At the other end of the table, Ipswich and Bolton fans may well fear the worst. After 20 games, the bottom two have been relegated in four of the last five seasons. Ipswich's tally of 11 points is the second worst after 20 games since the Championship was rebranded ahead of the 2004/05 season. But Fulham's achievements last season give hope to the chasing pack. They had won just 26 points after 20 games last season but still managed to secure promotion to the Premier League. Down at the bottom, history suggests struggling sides at this stage end up in the relegation scrap. Since 2004, no side has been relegated with a higher standing at this stage than Wolves' 17th place in 2012/13. Lewis Grabban has been hitting the headlines with 14 league goals, all coming in his last 13 appearances for Nottingham Forest. Derby's Harry Wilson is the man for goalkeepers to watch out for when he takes aim from range. His five goals from outside the area means he is only one off the leader in that category last term, Ruben Neves. Four of Birmingham's five headed goals during this campaign have been scored by Lukas Jutkiewicz. He has scored 10 league goals this season - already double his total from last season. No player has been involved in more goals than Brentford's Neal Maupay - his 19 goal involvements are five more than any other player. Harvey Barnes scored his eighth goal of the season on Monday in what is already his best goalscoring campaign to date - he could have had plenty more, had he not seen a league-high six attempts hit the woodwork. Another loanee Oliver Norwood has proven himself an outstanding addition for Sheffield United - his ability to unlock defences will be crucial if his club are to maintain their promotion push. So, it's all to play for at both ends of the table as we approach the halfway stage of the Championship season. Results during the frantic festive period will heavily influence clubs' standings come May. You can catch every moment, starting at The Hawthorns from 7pm on Sky Sports Football & Sky Sports Main Event.